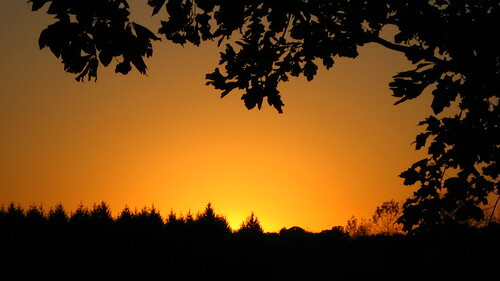 The sun sets over Hartman Creek forming silhouettes of the trees. 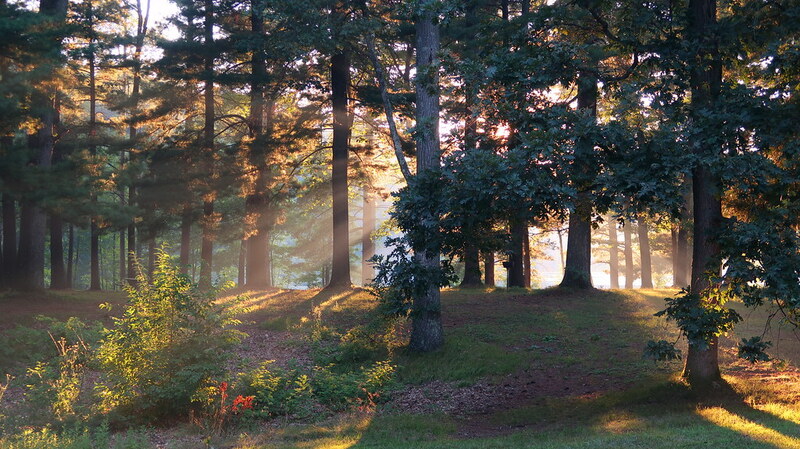 Sun beams peer through the trees at Hartman Creek State Park. This area of the park is a good place to contemplate. God creates amazing beauty for even the poorest of us. Last year, my Canon G12 died, so I decided to make a gallery of a few of my favorite images that came from that camera. This is my first gallery post. Just click on one of the small pictures to launch a carousel of higher resolution images. (If you set your browser to full screen (press F11 in Chrome and Firefox), the images should display even larger). 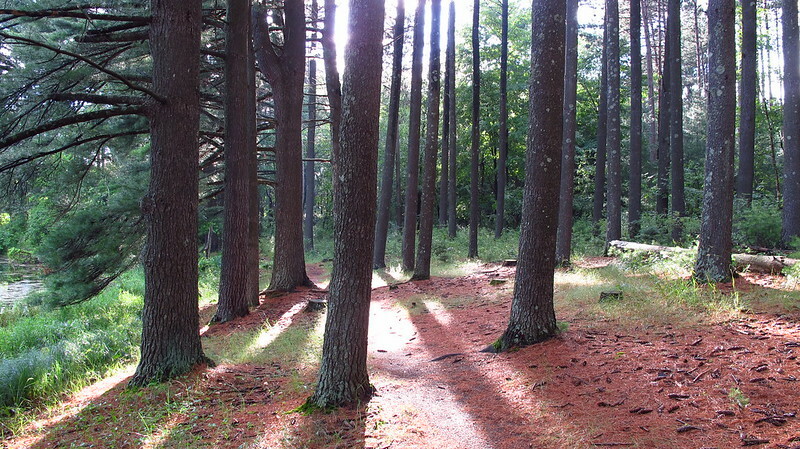 These pictures are from a hike in Hartman Creek State Park near Waupaca, WI. 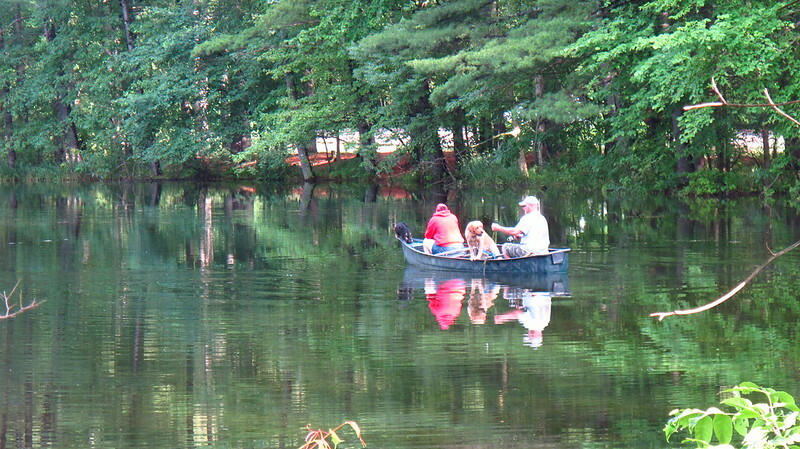 Fishing is popular in this area. Two canines helped in this photo. “It is not right to take the children’s bread and throw it to the dogs.” She said, “Yes, Lord, yet even the dogs eat the crumbs that fall from their masters’ table.” Then Jesus answered her, “O woman, great is your faith! Be it done for you as you desire.” And her daughter was healed instantly. Just wondering about the etymology and God’s grace. The sun came out after after a rain shower. Back-light illumination is one of my favorite ways to photograph vegetation. 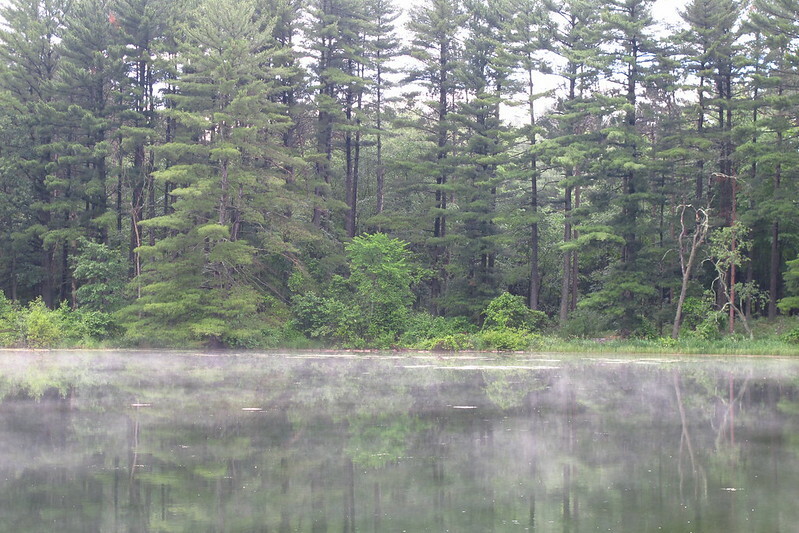 Rain fell as mist floated across the water. Hartman Creek is one of my favorite places to go mountain biking. 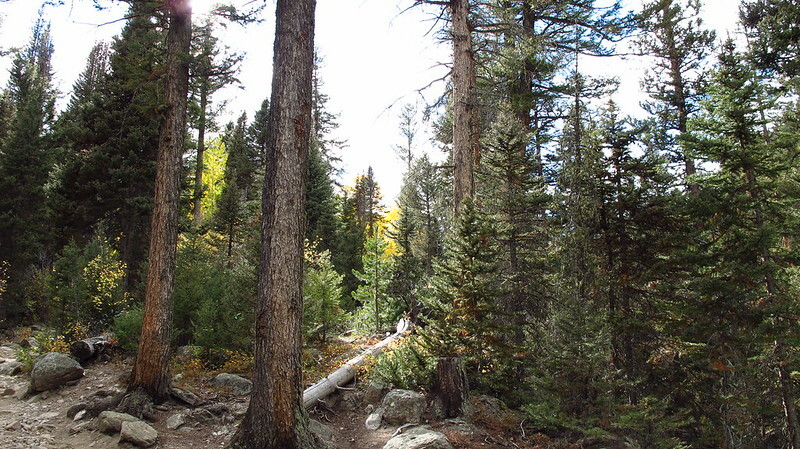 It has an extensive single-track and double-track trail system. However, I generally do not take pictures while mountain biking, opting instead to enjoy the sights and scents without electronics. If the weather is right, get outdoors, and go hiking. Enjoy what God has made. God made the outdoors, it’s the best artwork around, and we can live right in it. And don’t leave your friends (or family) behind. 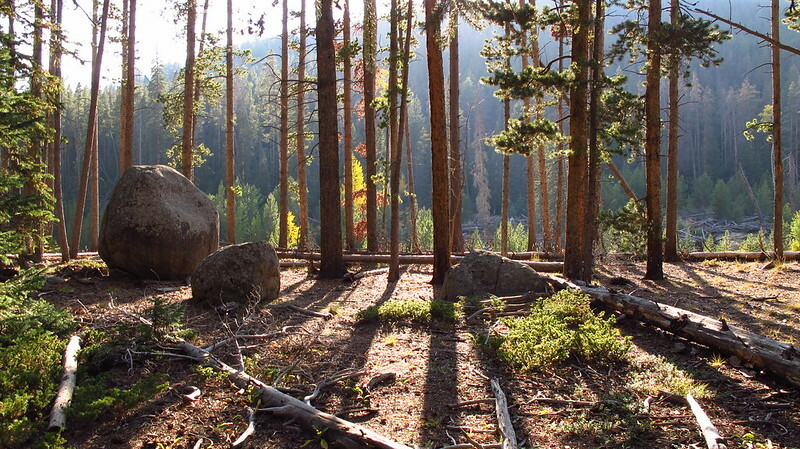 These pictures are from the Ypsilon Lawn Lake Trail in the Rocky Mountains in Colorado. One of the reasons I enjoy photography is the ability to explore and share different perspectives. This Spring, I was hiking with a friend, and we stopped by a footbridge that was under construction over a creek. We chatted briefly with the gentleman who was building the footbridge. 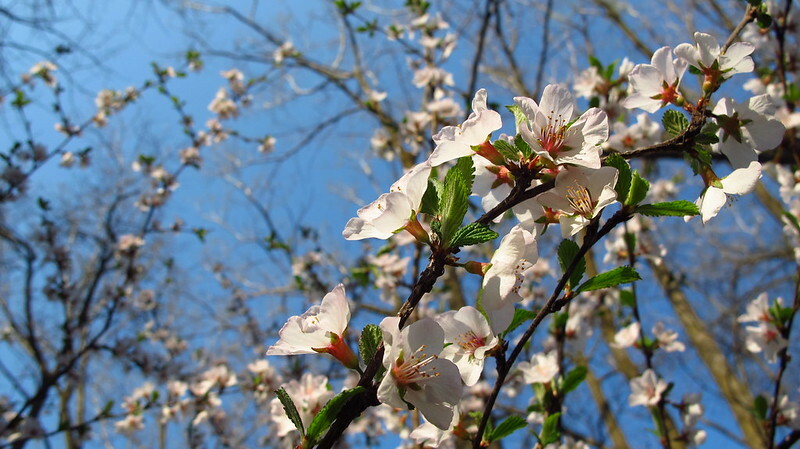 While there, I spotted a tree with these tiny little flowers, and snapped a few photographs. My friend thought I was taking pictures of the footbridge, and did not even notice the tree. 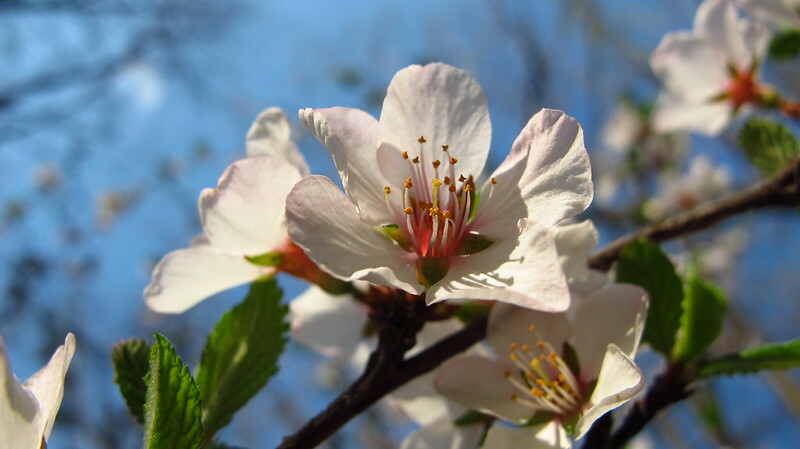 Even if no mortal ever saw these flowers or those particular blooms, they did exist. The truth exists outside of ourselves and our perceptions. God sees every perspective in the world; he sees everything. “But do not overlook this one fact, beloved, that with the Lord one day is as a thousand years, and a thousand years as one day.” (2 Peter 3:8, ESV). Imagine if you had a thousand years to explore every day. Vernal blooms, warm Summer rains, Autumn leaves, every snowflake, and every sunset would last a long time. Babies grow up quickly, but if we could savor a thousand years of family relationships every day, maybe, just maybe we could fully appreciate one another. Then again, we live in an imperfect world corrupted by sin. All that is, is passing away. The grass of the field, the birds of the air, and even family in our homes are here today, and then one day they are gone. That is the truth, this world is passing away. The defining truth of this world is death. But there is truth that is eternal, his name is Jesus, and he is not passing away. He conquered sin and death. In him, in heaven, a thousand years will be like a day, and a day will be like a thousand years. And there will be no sad days because the defining truth of Christ is not death, but life. “I am the way, and the truth, and the life. No one comes to the Father except through me.” (John 14:6, ESV). He is the truth, forever. Spotty rain clouds were sailing over the peaks while we hiked over the mountains on the Cub Lake trail in Rocky Mountain National Park. Taking photos was a challenge because the sun would come out, then hide behind a cloud, then come out again, and on and on. Often, I saw a shot, took my camera out, turned it on, lined it up, got focus, and whoosh another cloud. This happened repeatedly. Clouds have their own beauty, and spotty clouds scraping the mountain peaks can be quite breathtaking especially when they cause the sunlight to fall in beams or crepuscular rays. Nonetheless, a cloudy diffused light often doesn’t make the best photograph. I am posting the following two photographs taken only moments apart to demonstrate the difference sunlight can make. In this top photo, the sun is blocked and diffused by clouds. In the photo below, the sun is shining through the clouds. These two pictures were taken almost at the same time and from almost the same spot. As the wisdom of Scripture says, “Light is sweet, and it is pleasant for the eyes to see the sun.” (Ecclesiastes 11:7, ESV). 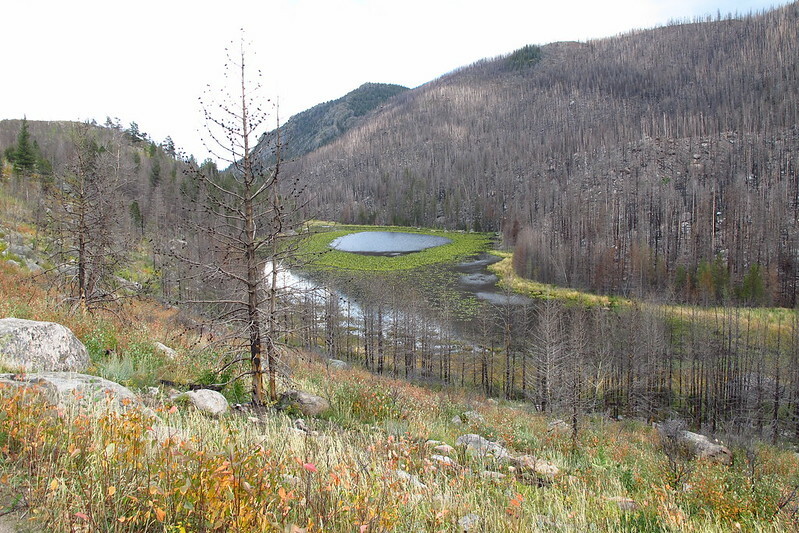 As a final note, there was a big forest fire around Cub Lake the year prior to this hike. 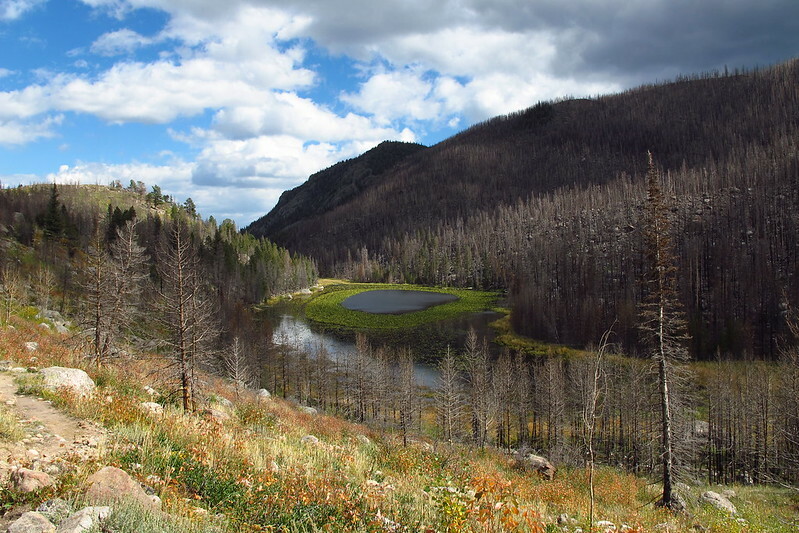 Some careless campers let a fire get out of control, and it burned this entire area. If the tree roots holding the rock and soil in place on the mountain slope rot away before new trees take their place, there could be landslides, and this would become a different place. So far at least as of last Autumn, the trees were burned and dead, but the wood and roots were still solid and strong. Let us walk in the light, and let us always enjoy God’s blessings while we have them. Many in the mid United States are tired of the windy cold and snow. Yes, it’s been cold. 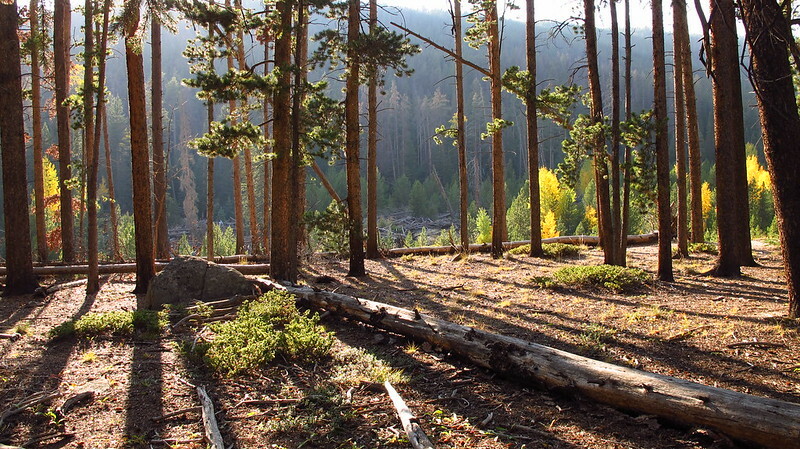 The picture above is of a September day in Rocky Mountain National Park. The sun shone off and on, and it was a fairly warm day. 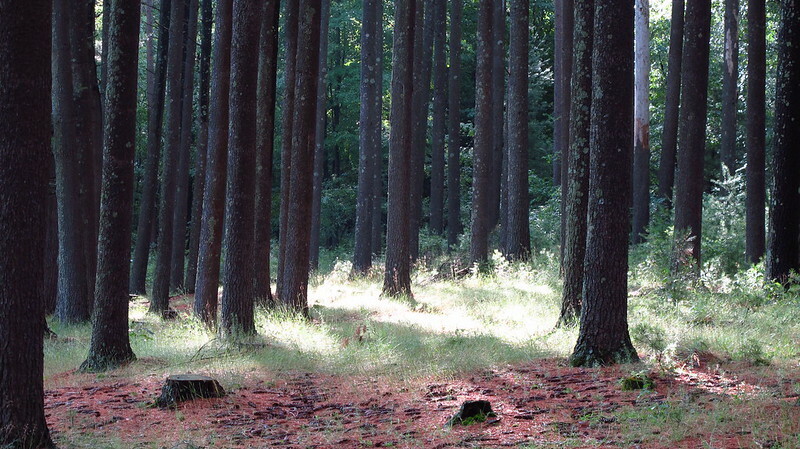 Some of those trees are young, some are old, and some are lying on the ground. Trees, people, and seasons all come and go. It won’t be Winter forever. [Nonetheless, God] has made everything beautiful in its time. Also, he has put eternity into man’s heart, yet so that he cannot find out what God has done from the beginning to the end. — Ecclesiastes 1:4-6, 9; 3:11, ESV. Be it people or seasons or any other natural beauty, may God grant to all of us the ability to enjoy everything that is beautiful in its time, today. 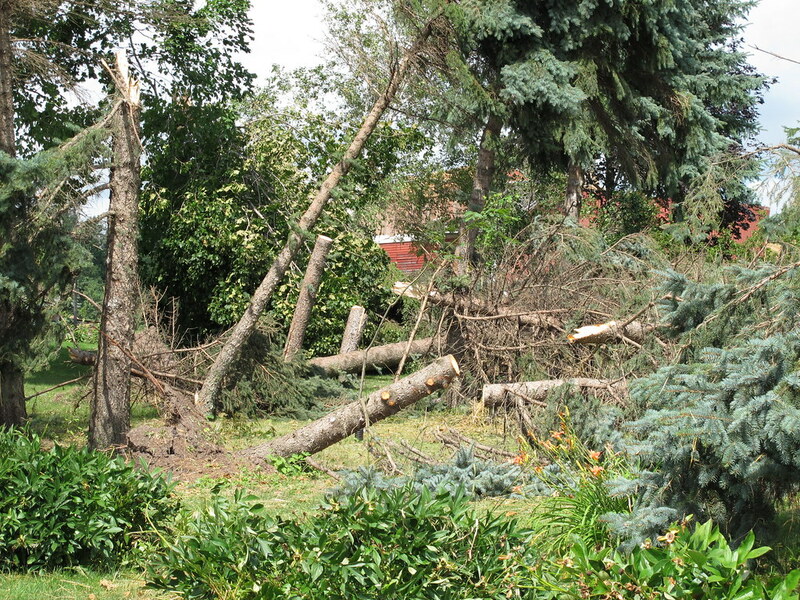 Early on Wednesday, August 7, 2013, tornadoes and strong winds blew through Wisconsin’s Fox Valley. The pictures in this post show damage from the tornado that destroyed buildings and trees in Freedom, WI. No lives were lost directly from the storm itself. Whenever disaster strikes, it is a call to repentance and faith. God will protect His faithful in Christ, if not in this life, then in the next. On the cross and through the tomb Christ weathered the worst storm of all: death itself. Of all men, He alone came through, and is now our calm place in the wind. “What manner of man is this, that even the winds and the sea obey him!” (Matthew 8:27, KJV). No matter how weak and small we are God can and will protect us. The pictures in this post are from the same area where about 110 trees were snapped, splintered, and ripped out by the roots. 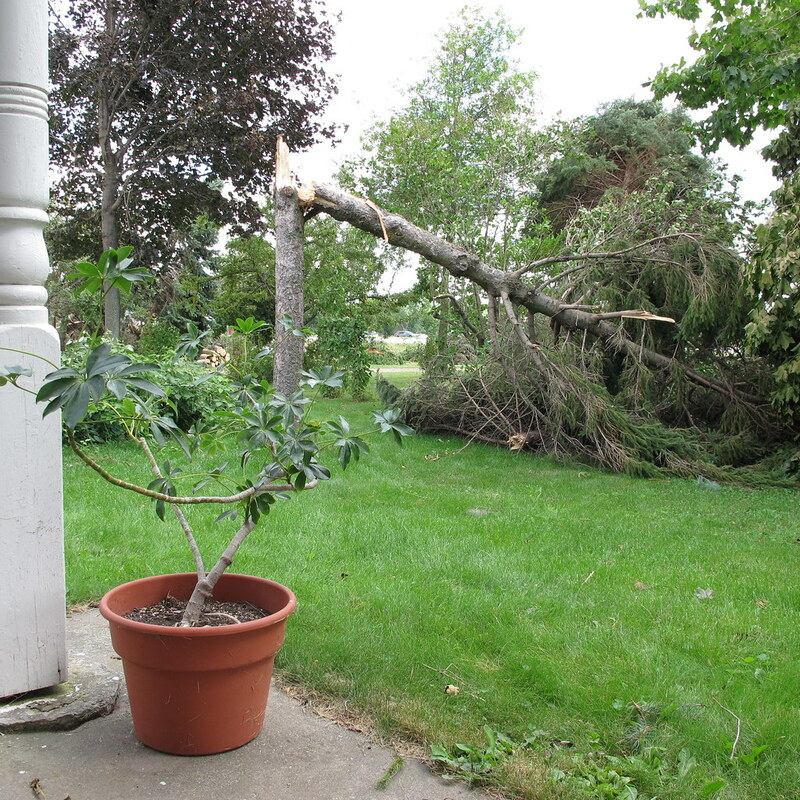 In the picture below there are two plants: one sturdy old evergreen that had weathered many a storm, and a potted plant. One tipped over, the other didn’t. “Fear not, little flock; for it is your Father’s good pleasure to give you the kingdom.” (Luke 12:32, KJV). One of the activities photographers engage in on Flickr is creating a photo set with one picture from every day of the year. This helps photographers to expand their skills by challenging their abilities to shoot in different kinds of light and under different conditions. 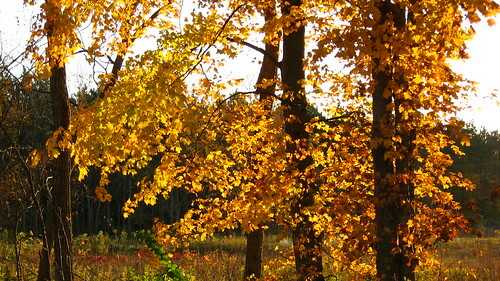 The two pictures above were both taken at Hartman Creek in Wisconsin, on the same warm October day. Evergreens are always colorful and photogenic. However, not every tree is an evergreen, so sharing a beautiful photo from every day of the year in Wisconsin would be a challenge, especially if one is not particularly into self-portraiture. Even though every day does have its own kind of beauty, some months might consist of 29 pictures of gray. Maybe someday I will attempt a 365 day photo project, but in the meantime I have decided that I should better utilize Flickr by posting and sharing more photographs. The pictures below are all from one day in the Kettle Moraine Forest near New Fane, Wisconsin. 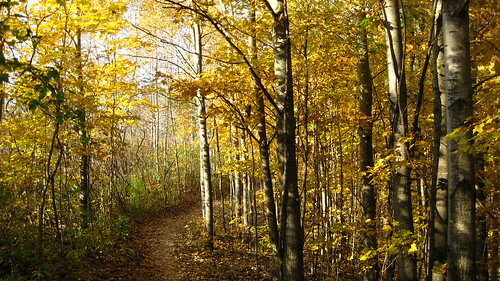 Here, a single-track mountain bike trail winds its way through the golden Kettle Moraine Forest. 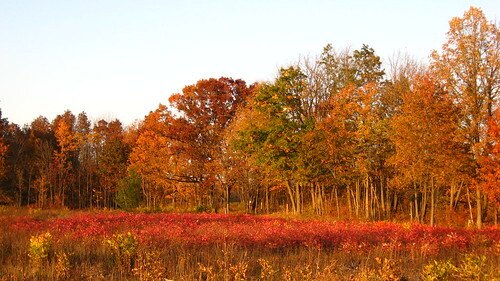 In Wisconsin, October is a colorful month, and some days are worth more than one photo. 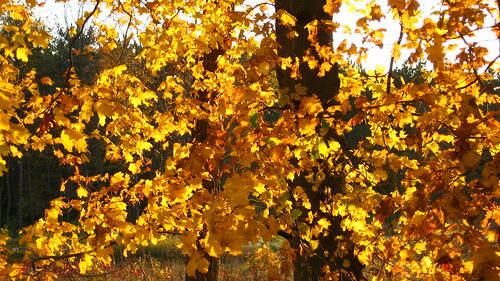 Above, a fiery warm sunset illuminates golden trees in the Kettle Moraine Forest. The sun is at our back. 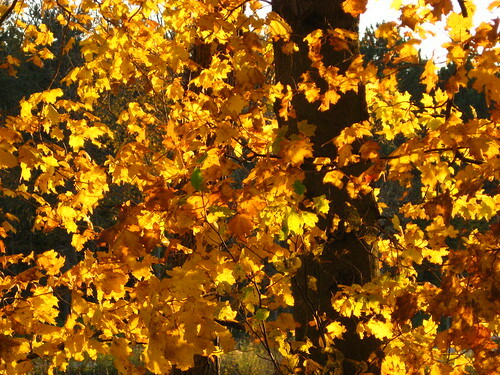 Autumn leaves, filled with golden sunlight, glow against a dark background. Sometimes, I think the lives of Christians are like those leaves: just as the leaves are filled with and reflect the physical light of the sun, so also our lives are filled with and reflect the spiritual light of the Son of God. 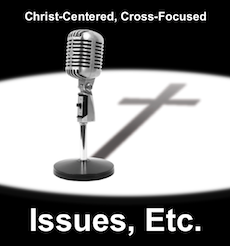 If “anything is excellent or praiseworthy—think about such things.” (Philippians 4:8, NIV 1984). 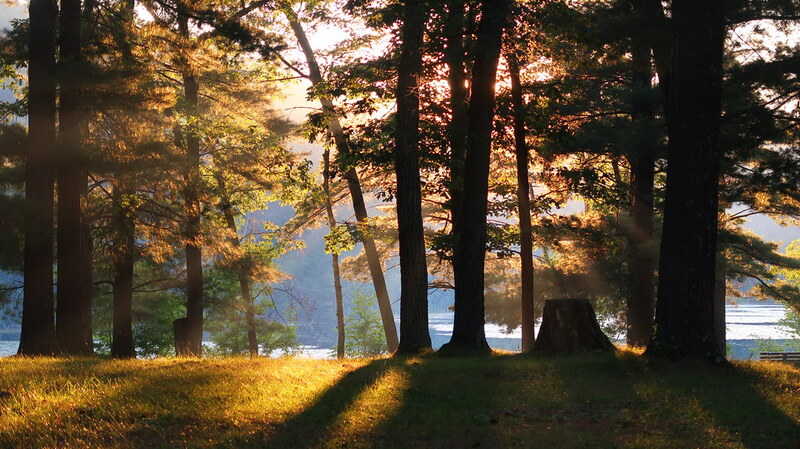 The sun sets at the Kettle Moraine Forrest near New Fane, Wisconsin. Even if one does not take a beautiful picture every day; in Christ, every day is still a good day. 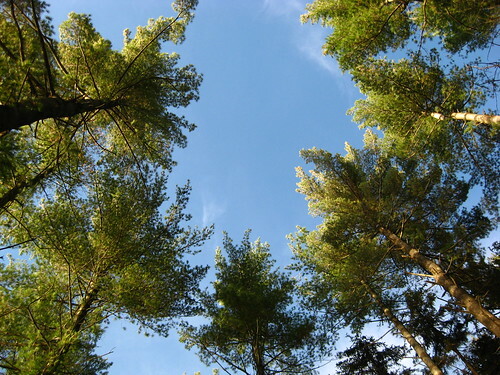 Potawatomi State Park in Door County, Wisconsin is cutting down (according to my estimate based on the pictures I took) at least one thousand trees, many of which are 75 years old and older, in order to build a new RV group campground. This is shameful for at least two reasons. First, this particular natural area was especially beautiful. Second, on the other side of the park there is an abandoned ski area and former group campground. It currently has an overturned rotting picnic table, power poles laying in the grass, gravel roads and parking areas covered in weeds, a building with boarded up and broken windows, broken glass, rusted machinery, wires laying on the ground, and refuse strewn over approximately 20 acres. The DNR could clean up and reclaim this abandoned area as a campground. There are many tall trees there, and if the garbage was picked up, it would be quite scenic. But rather than do that, the DNR is instead cutting down majestic trees in the park’s most pristine natural area. How does the DNR justify this? 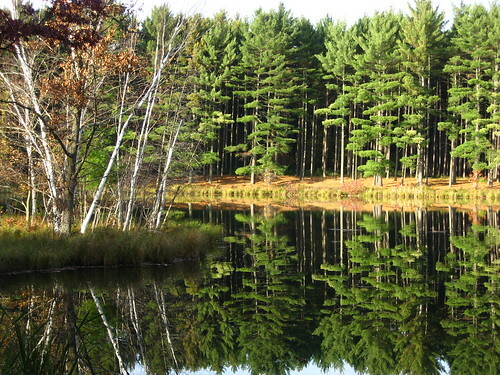 The DNR says they are following the park’s master plan. However, there are at least two flaws with this argument. First, when the master plan was approved over 21 years ago, the ski area was still being used for skiing. However, the amounts of rust on the abandoned equipment, the broken glass, and the decay of the wooden structures all testify that this area has been abandoned for many years. The master plan is hopelessly outdated. Second, the trees are being cut east of where the master plan says the group campground should go, so they are not actually following the master plan. Finally, it appears as though the DNR may not have gone through the public notice/public comment period required under the WEPA for a building project of this size. This new group campground is being paid for with conservation and stewardship funds of over $300,000. (I received this information from the Door County Environmental Council). The DNR should halt this campground until the master plan can be updated so that there can be public input and participation on the project. This is an overall picture of the abandoned former campground/ski area inside Potawatomi State Park. 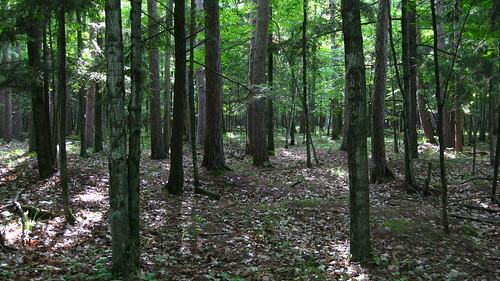 The trees behind and to the left of the lodge have areas cleared out for camping and/or parking. The trees on the right and far left are also inside the park. 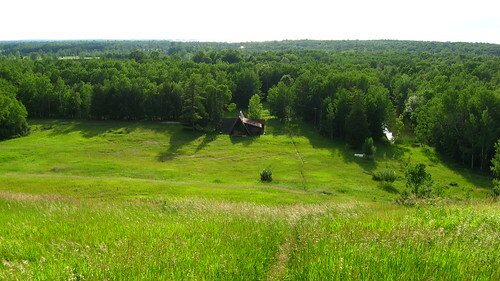 This picture was taken from the top of the former ski hill overlook. This picture shows the condition of the lodge (the triangular shaped building in the first photo). 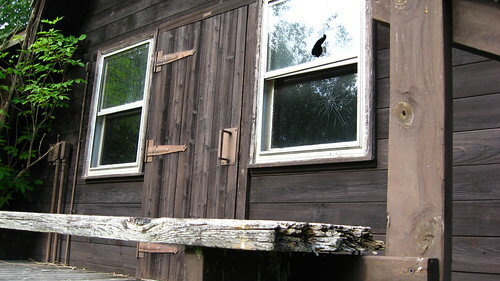 Notice the rotted wood and broken windows. 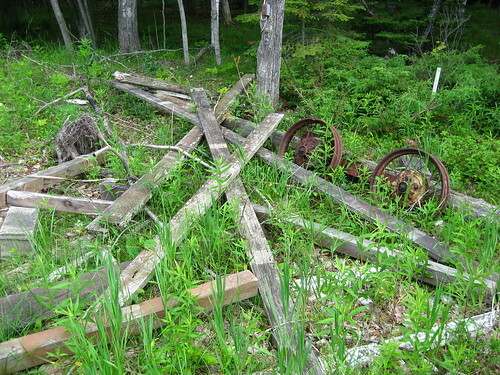 This is a picture of rusted machinery and boards partly up the side of the hill. For additional pictures go to this Collection of Photos. 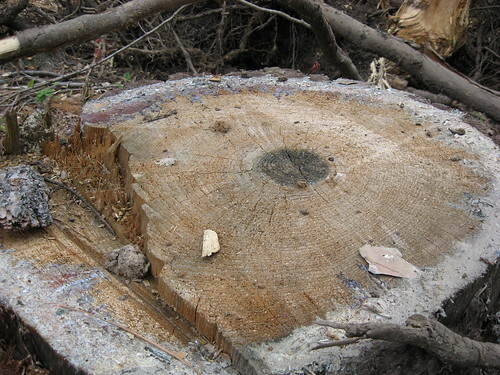 This is a picture of a stump from one of the trees that has been cut down for the new group campground. I count 75 tree rings. On a picture of another stump from the new campground, I counted 85-90 tree rings. The picture at the top of this post is also from this same natural area.